Peter Stubley. The Independent. Fri, 19 Apr 2019 18:25:00 GMT. ABC News. Fri, 19 Apr 2019 13:00:08 -0400. Joyce Vieira and a friend were taking photos on a beach in Rio de Janeiro when she claims she saw a man masturbating in front of her. She launched a series of punches at the alleged pervert. Daily Mail. Fri, 19 Apr 2019 12:53:36 GMT. Yahoo. Thu, 18 Apr 2019 16:16:28 -0400. Voice of America. Wed, 17 Apr 2019 10:58:36 -0400. Zacks Equity Research. Zacks. Wed, 17 Apr 2019 13:07:00 GMT. Voice of America. Tue, 16 Apr 2019 22:25:34 -0400. Alejandro Sanchez, Washington, Dc. Janes 360. Wed, 17 Apr 2019 00:00:00 GMT. Merrit Kennedy. NPR. Tue, 16 Apr 2019 17:41:22 -0400. The government of Brazilian President Jair Bolsonaro announced Tuesday a financial package aimed at staving off a potential truckers' strike. C.h. Gardiner. Fox News. Tue, 16 Apr 2019 20:05:35 GMT. 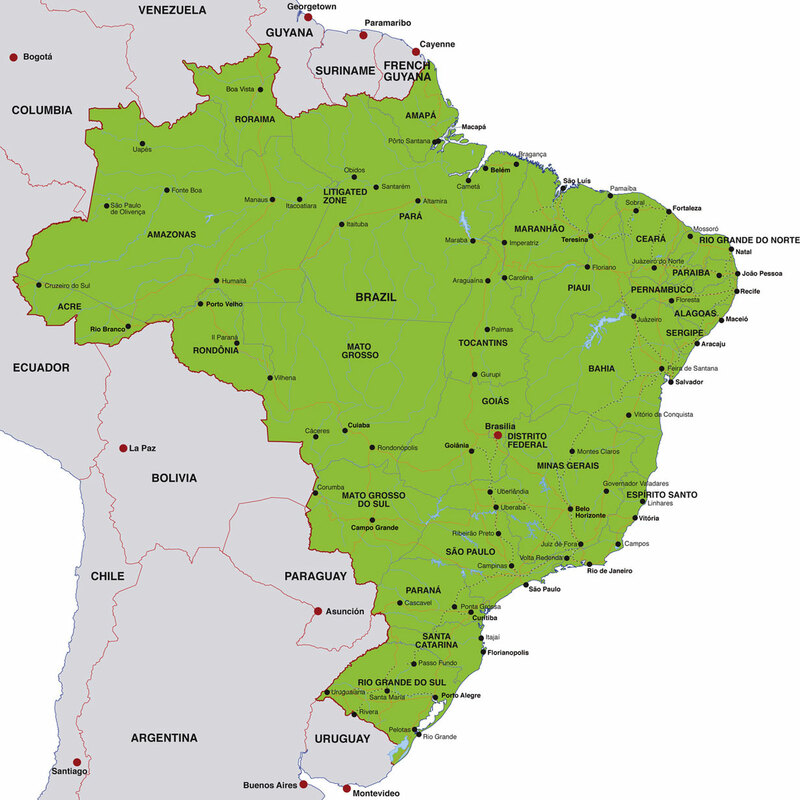 The Federative Republic of Brazil is located in the east central portion of South America. Its bicameral National Congress consists of a Federal Senate and a Chamber of Deputies. Brazil's capital city is Brasilia; its major cities include Sao Paulo and Rio de Janeiro. Brazil's national currency is the Real, which equals 100 centavos. The primary language used by Brazilians is Portuguese and, in 2007, Brazil's estimated population was 190,011,000. For more news and information about Brazil, visit this official Brazilian government website and the Brazilian Tourism portal. Click on the small Brazil map shown at right to display a full-size Brazil map.